Whoever said you can't have quality AND quantity obviously has never been to Langam's Melba Restaurant for lunch, a five star hotel on the river with a five star buffet experience. 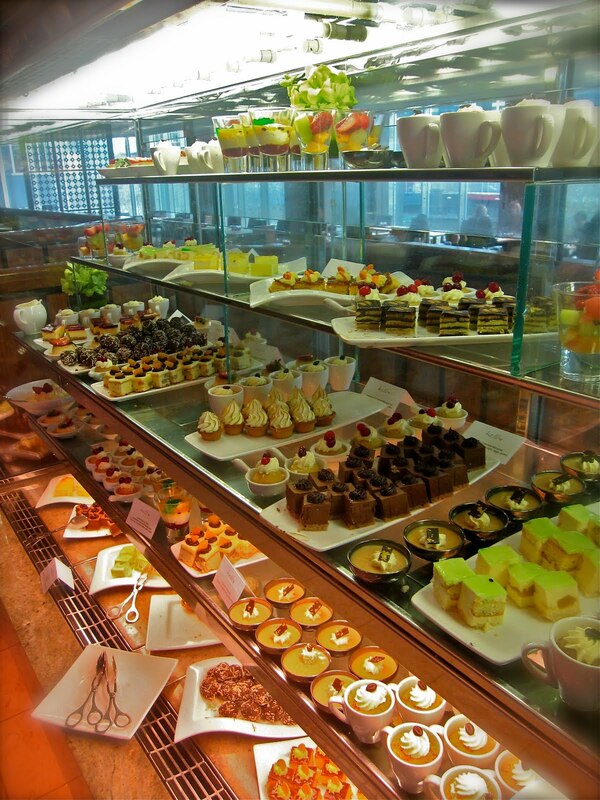 While there is an A La Carte menu, you would be crazy not to involve yourself in the buffet. I say 'involve' because it is certainly an all-consuming experience. While it may be pricey for your average lunch, you get more than your money's worth when you consider the endless quantity of food, humongous variety, and of course the quality. For $49 a head (during the week), I succumbed to the glutton within. Upon arrival, one has the thought that in such a fancy place, you ought to contain yourself and retain your dignity. Walking through the golden lobby of the Langham and up the sparkling staircase (water feature included) I told myself to act - well, classy. But the moment I spotted the buffet, I am certain my eyes bulged from their sockets and my jaw dropped open. But a waiter, ready to serve us the moment we walked in, distracted me from my stupor. The service is impeccable. We were shown around the buffet the same way one would show you around a large property that was for sale and then escorted to our table. I barely sat down before grabbing a plate and getting started. I wouldn't have known where to begin if it were not for the waiter's suggestion that we start with the seafood. Lined up in glass cases were half crabs, king prawns, green lipped mussels and seafood salad (which consisted mainly of baby octopus and scallops). Next, sticking to the seafood theme, I tested out the sushi station. With a sushi chef arming the counter, you only have to point before he slices up A grade tuna and salmon and places it delicately on a plate for you with garnish. You can also construct your own sushi rolls, choosing your ingredients so the chef can roll, slice, and place them on your plate for you to place (less delicately) in your mouth. Go easy on the wasabi. Hesitant to tackle the 'main' stations so early, I headed to the appetizer/antipasto section, which was only slightly less intimidating. Everything is flawlessly prepared. A selection of salads including potato, celery, green, and my favourite, pear, rocket an d blue cheese, are a refreshing 'break' between courses. There is also a range of high quality cheese including Tasmanian Brie, Yarra Valley dairy Blak Savourine semi matured goats cheese, South Cape blue cheese, Melusine's goats cheese, aged cheddar and more. My personal favourite is the Manchego cheese with quince paste squares on top of each block. The antipasti are also delicious: salami, prosciutto, and other cured meats, dolmades, olives, sardines, anchovies, preserved lemon, sun dried tomatoes and more. After conquering the antipasto, the re was no turning back. It was time to head over to the hot sections. To begin with I had Asian cuisine. Specifically, Peking duck pancakes are carved for you on the spot with assorted dumplings. There is also a choice of roast sirloin with roast veggies. You can also pick/choose your own ingredients and have a stir-fry whipped up right in front of you. Or if you simply cannot wait when surrounded by so much food, you can also choose the vegetarian egg noodles, penne carbonara, or ravioli. Perhaps the most impressive station is the Indian food. Inside a number of red en pots enamel a line you will find saffron rice and a variety of curries: chicken tandoori, chicken tikka, garlic fish tikka, Tala Hua Gosht (beef), and vegetarian curry. To top it all off, a chef awaits you at the end to cook you fresh naan bread; I recommend the garlic and cheese naan but be careful not to burn your mouth on the hot cheese that oozes out as you take a bite! There is also a range of tasty condiments including chutney, lemon pickle, beetroot raita, mint yoghurt and pappadams. So if by the end of this extravaganza you somehow have room for dessert (thankfully human beings have a separate dessert stomach!) you can revisit the naan station. But instead of cheese and garlic, try mini M&Ms and chocolate flakes (spotted concoction in photo above!). Alternatively (or additionally), head over to the chilled dessert cabinet. If you can bring yourself to bite into one of these miniature art works, I strongly suggest you do. Usually when there are so many pretty desserts, they often don't taste as spectacular as originally expected. At Melba, this is not the case. From mini lemon meringue pies and flourless orange cakes, to dark chocolate marquises and pear and lychee Charlottes, these beauties do more than just look good: they taste great. Lining the shelves you will also find white chocolate brownies, spiced panacottas, lemon mousse trifles, coffee mousses, rum balls and more. But it doesn't stop there. 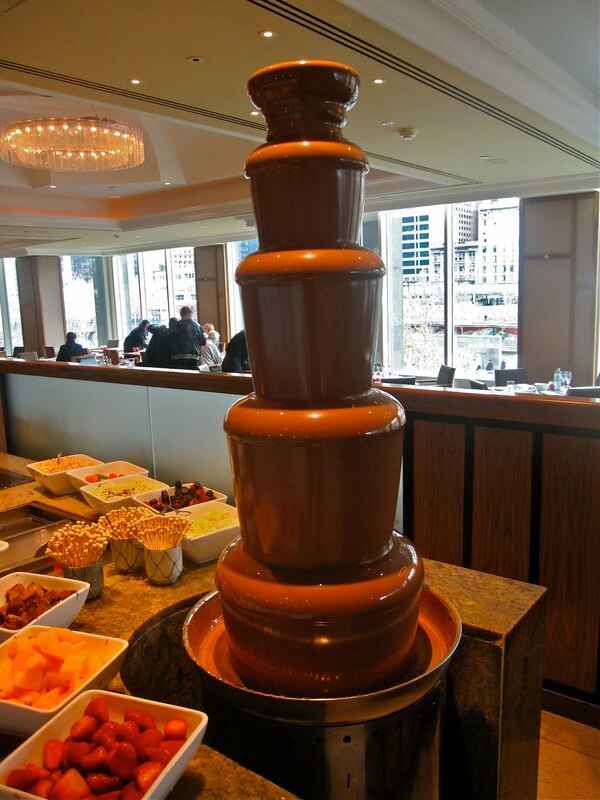 Sitting next to the dessert cabinet like a fat exclamation mark is the largest, most attractive chocolate fountain I have ever seen. With strawberries, melon and chunks of cake to dip, you will eat until you feel sick. To top it all off there is an incredible sticky fig pudding available with hot sauce. The kids will head straight for the self-serve chocolate, vanilla and strawberry ice-cream, topped off with chocolate sauce, sprinkles, and lollies - just in case there isn't enough already. Aside from the food, the ambiance was brilliant. With floor to ceiling glass windows there are beautiful views of Southbank and the river - try to nab a table near the window. The restaurant was humming with people 'in the know;' a goof miz of 'suits' and ladies doing lunch, enjoying a terrific value buffet with one of the best outlooks in the city. After my voracious rave, there is no doubt about this rating: 5 out of 5 lip smackers for Melba!